For years American urban parks fell into decay due to disinvestment, but as cities began to rebound—and evidence of the economic, cultural, and health benefits of parks grew— investment in urban parks swelled. The U.S. Conference of Mayors recently cited meeting the growing demand for parks and open space as one of the biggest challenges for urban leaders today. It is now widely agreed that the U.S. needs an ambitious and creative plan to increase urban parklands. Urban Green explores new and innovative ways for “built out” cities to add much-needed parks. Peter Harnik first explores the question of why urban parkland is needed and then looks at ways to determine how much is possible and where park investment should go. When presenting the ideas and examples for parkland, he also recommends political practices that help create parks. 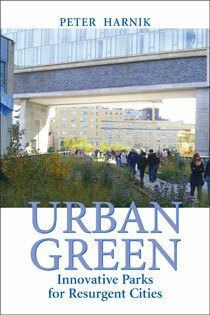 "Urban Green is part reference manual, part guidebook and part inspiration. It provides an unprecedented look at the re-greening of urban America. From rail trails to rooftops to landfills, Peter Harnik shows us how to find and fund green spaces for the next century." "Urban Green is a testament to the progress of the livable communities movement. While others cringe at urban eyesores—underutilized parking lots, vacant commercial areas, and abandoned rail lines—Harnik sees new green spaces for residents to stroll, garden, play, socialize, and enjoy their natural heritage. Best of all, he offers practical advice on politics and funding, providing community leaders with tools for turning their vision into reality." "Peter Harnik …reveals how the push to preserve and promote our nation's urban parks is one of the most exciting frontiers in urban planning, dramatically changing the way we think about what is possible in a 21st-century city." "Specific, succinct, well-written, full of innovative ideas from all over—Peter Harnik's Urban Green: Innovative Parks for Resurgent Cities is all one could ask of a practical planning book." "With this timely and valuable book, Harnik has done a great service. Public-sector officials, planners, and designers will find it useful, but so will community activists, neighborhood groups, and anybody else who uses an urban park. Which, in a densely populated city, is just about everyone." "Harnik conveys in pragmatic, no-nonsense terms what it takes to make the outdoor rooms of a city serve the true needs of their users. Fundamental questions are asked about which kinds of parks to build, how much to build, for whom to build, and where the parks should go. The answers imply new or renewed solutions and new ways of defining the very term parks." Chapter 1. How Much Parkland Should a City Have? Chapter 3. Is it Acres, Facilities or Distance? Chapter 6. It's Not How Much but Who and Why? A Changing Climate Means A Changing Society. The Island Press Urban Resilience Project, Supported By The Kresge Foundation And The JPB Foundation, Is Committed To A Greener, Fairer Future.​This Post Was Originally Published In Parks and Recreation Magazine. In 2013, the city of Norfolk, Virginia, removed almost 70 benches from three small city parks. The benches weren’t in disrepair and they weren’t in a bad neighborhood. In fact, they were located in the revitalizing historic community of Ghent, and, if anything, were incredibly popular. Unfortunately, it was the wrong kind of popularity. Judged negatively by some neighbors as a milieu for loitering, drinking, fighting and even prostitution, the benches of Stone Park and Stockley and Botetourt Gardens were deemed facilitas non grata. When asked if he considered the removal a success, Jason Baines, a park department landscape architect, was cautiously tight-lipped about the painful battle. “The citizens were satisfied,” he said. But, not all of them. In an open letter to the Norfolk City Council, published by local news source AltDaily, Norfolk landscape architect Bill Speidel wrote, “It tells the public that we are not welcome to use that park; that it should be an empty void.” In his letter, he suggested other possible courses of action, such as making simple design modifications to the benches. Norfolk isn’t alone. In recent years Pittsburgh has taken benches out of Allegheny Commons, Roanoke has removed them from Elmwood Park, and Sarasota has done the same in Selby Five Points Park (although the city is now reconsidering). In New York City, a number of park benches were purposely removed in the 1980s, although that is no longer a standard practice. Philadelphia’s famous Fairmount Park is such a bench-free environment that nearby residents drag portable chairs across busy Parkside Avenue to have a place to sit and automobile visitors can be seen taking folding chairs out of the trunks of their cars. Other than trees, it’s hard to find something as intrinsic to people’s concept of an urban park. “The bench is really a symbol of parks,” says Mark McHenry, Kansas City parks director. The prominent advocacy organization New Yorkers for Parks even chose a park bench for its logo. In fact, is a park without benches even a park? Continue reading the full post on Parks and Recreation. Peter Harnik is director of the Center for City Park Excellence at the Trust for Public Land and author of Inside City Parks, a book about the park and recreation systems of the 25 largest U.S. cities. In 2003, his research resulted in The Excellent City Park System: What Makes it Great and How to Get There. Previous to that, he was co-founder of the Rails-to-Trails Conservancy. Alexandra Hiple is Research Associate, Center for City Park Excellence, at the Trust for Public Land.